Overview - Written by Academy Award® nominated scribe Becky Johnston (Seven Years in Tibet), ARTHUR NEWMAN follows the mid-life travails of sad sack Wallace Avery (Colin Firth). 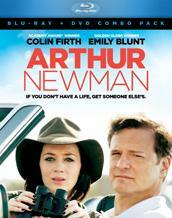 Refusing to face a life he hates, he stages his own death and buys himself a new identity as Arthur Newman. However, Arthur s road trip towards a new life is interrupted by the arrival of the beautiful but fragile Mike (Emily Blunt), who is also trying to leave her past behind. Drawn to one another, these two damaged souls begin to connect as they break into empty homes and take on the identities of the absent owners. Through this process, Arthur and Mike discover that what they love most about each other are the identities they left at home, and their real journey begins. If you're going to fake your own death in order to reinvent yourself under a completely new identity, you should probably make sure that your new persona will at least be more interesting than your last. Unfortunately, that's really not the case for the protagonist of 'Arthur Newman,' and the decidedly banal results end up being more troublesome to audiences than the man himself. Despite some earnest filmmaking, the drama never really adds up to much, and the runtime gets bogged down by a dull pace and a lethargic tone. Stars Colin Firth and Emily Blunt turn in solid performances, but the movie fails to go that extra step, making one wish that the script would take a cue from its main character and go through a revision or two of its own. Suffering from a mid-life crisis and stuck in an emotional rut, failed pro-golfer and divorced father, Wallace Avery (Colin Firth), decides to fake his own death. Leaving his girlfriend (Anne Heche) and estranged son (Lucas Hedges) behind, he assumes the identity of Arthur Newman and heads off for a new town where he can reinvent himself. On the way, he crosses paths with a depressed young woman, Mike (Emily Blunt), who has emotional problems of her own. As they bond over their mutual distress, the pair decide to break into homes and pretend that they're the owners. But will their games of make believe truly fill the holes in their hearts, or will they have to finally face the problems they ran away from? The setup here is all pretty basic, and sadly the film's first act is quite tiresome. Actually, it's downright sleepy. Firth's character initially exhibits zero personality and it's hard to get a sense for the man, making it difficult to understand or sympathize with his decidedly drastic actions. To this end, we don't see much of Avery's lackluster life or get much of a feeling for why he wants to escape it. Of course, this is all by design, and more details are revealed later on to help flesh his motivations out, but in this case a bit more information upfront would have helped make these earlier scenes interesting. Once Emily Blunt's character is introduced, things perk up a little, but even then it takes a while for the film to find an engaging rhythm. Ultimately, the movie eases into a classic road trip scenario, and these sequences prove to be the most involving. On the way to their destination, Arthur and Mike make various stops, and as their burgeoning romance heats up, they decide to fool around with other people's homes, clothes, and identities -- all while they simultaneously fool around in their beds. These playful and occasionally romantic scenes are actually kind of fun, and the deeper subtext dealing with the characters' fear of themselves, and their desire to escape their own realities, is fairly interesting. With that said, the movie never delves far enough into these ideas, and just when this role playing premise starts to get interesting, the film decides to move on. For the most part, Firth and Blunt are both good in their roles, though neither character is particularly memorable or fully realized. While Firth's Newman does eventually reveal deeper layers filled with regret and melancholy, for the majority of the runtime the character doesn't make for an especially interesting protagonist -- no matter what he chooses to call himself. Blunt's Mike starts off rather gloomy, but the actress finds an appropriately manic balance between reckless abandon, playful flirtation, and more devastating sorrow. Though both actors share decent chemistry, their relatively fast coupling is a little hard to buy, and without giving too much away, the ups and downs in their relationship could have used a little more development. Come to think of it, the film's conflicts as a whole could have used a few more beats, and as it stands, very little actually happens. 'Arthur Newman' tries to be a perceptive drama about identity, fresh starts, and healing the mistakes of the past, but while there are a few genuinely affecting scenes that come close to true insight, the plot simply never amounts to much. Just when things start to get interesting, the story basically wraps up, and the whole endeavor ends up feeling a tad pointless. Arthur's journey has its moments, but it's just not that interesting, and though the acting is good and the direction is perfectly fine, this is a road trip film that never quite finds its way. New Video Group presents 'Arthur Newman' in a Blu-ray/DVD combo pack. A BD-25 disc and a separate DVD disc are housed together in a keepcase. After some logos and warnings, the disc transitions to a standard menu. The movie is provided with a 1080p/AVC MPEG-4 transfer in the 2.35:1 aspect ratio. The film's style can be a bit underwhelming at times, but this is a solid transfer with no major technical issues. Shot on the Arri Alexa, the digital source is mostly artifact free, but there is some light grain-like noise present and there are very faint signs of compression in dark scenes. The image is on the soft and flat side, but clarity is still pleasing. Colors are noticeably subdued, and the palette veers toward autumnal hues along with a teal and orange push. The picture does look a bit dim, with comparatively low contrast, but shadow delineation is good. With that said, blacks can look a tad elevated in a few shots. Modest but free from any major issues, 'Arthur Newman' comes to Blu-ray with an uneventful image that gets the job done. It lacks the HD sheen and depth that many other contemporary digitally shot films have, but the softer picture is pleasing in its own right. The film is presented with an English DTS-HD MA 5.1 track and no subtitle options. Modest but quietly immersive, the mix does a nice job enhancing the movie's atmosphere. Dialogue is mostly clean and well prioritized, but there are some isolated scenes outdoors where speech becomes a little muffled or thin. Though subtle, the soundstage features a welcome air of texture, bringing a delicate but convincing sense of place to the movie's various settings. Appropriate effects like passing sirens, chirping birds, rustling trees, gentle winds, bellowing waves, and squawking gulls all add personality and dimension to the mix, and separation and directionality between the front and surround speakers is natural and organic. The film's score is also clear and crisp, and though low frequencies are negligible (the content doesn't call for much bass activity) dynamic range is wide and distortion free. This is a relatively quiet movie, but the audio's subtle design work is effective, conveying a welcome level of ambiance. Behind-The-Scenes Featurette (HD, 30 min) - Presented in 1080i with DTS-HD MA 2.0 audio, this is an informative featurette with cast & crew interviews along with some footage from the shoot. The participants discuss their reactions to the script, and elaborate on the story, characters, and themes. Some interesting trivia is also shared (apparently the screenplay was written over twenty years ago, and was originally intended for Nick Nolte). While the cast and filmmakers admire the movie quite a bit more than I do, this is a worthwhile featurette that offers a little bit more than the usual standard fluff. 'Arthur Newman' is a well intentioned drama that tries to offer some genuine insight. Sadly, the runtime is mostly dull and the characters aren't fully engaging. The video and audio are both very respectable, offering a modest but effective experience. Though we only really get one supplement, the included featurette is actually pretty interesting. This is a flawed effort, but the acting is good and there is definitely some merit in the filmmaking. If the story sounds intriguing to you, this might make a solid rental.